This is one of those – “Are these photos real?” type of transformations. Honestly, we’re more blown away by this than you can imagine. This very example is why we love being a part of the skincare industry so much! Can you believe the results in just 4 weeks? Chris is so happy! He can’t believe the results! They are truly remarkable. We asked what he thought of the transformation. We recently became friends with Chris, and when he found out that we write about skin care, he asked if there was anything that could help his skin. Ironically, we had just done an article on brightening called “Out Damn Spot – Out I Say!” and knew that we had an arsenal of products to suggest to him. So we reached out several brands that we work with and asked lots of questions and then came back to Chris with a suggested home care protocol. We knew he was going to need to do some exfoliation to work at removing surface dead skin and hyperpigmentation. We also wanted to get a few brightening products on him to even out the skin tone. Maybe a dash of acid to keep those pores clean and add a little lightening boost? We emailed Elaine Sterling from Elaine Sterling Skincare and asked if her Brighten Me and Micro C Exfoliant were safe for black skin and she instantly shot back an affirmative response! Ok, that’s great! We also gave him Elaine’s Pure C Serum, because everyone needs a little Vitamin C in their life. BONUS: It also has some brightening properties too! All of this exfoliation will strip away dead skin, debris, and excess oil. It’s good for Chris’s skin, but it’s also rough on the skin. It’s so important to make sure that we’re helping the skin to rebuild. We turned to our girl Dasha Saian, from Saian SkinCare, for this! 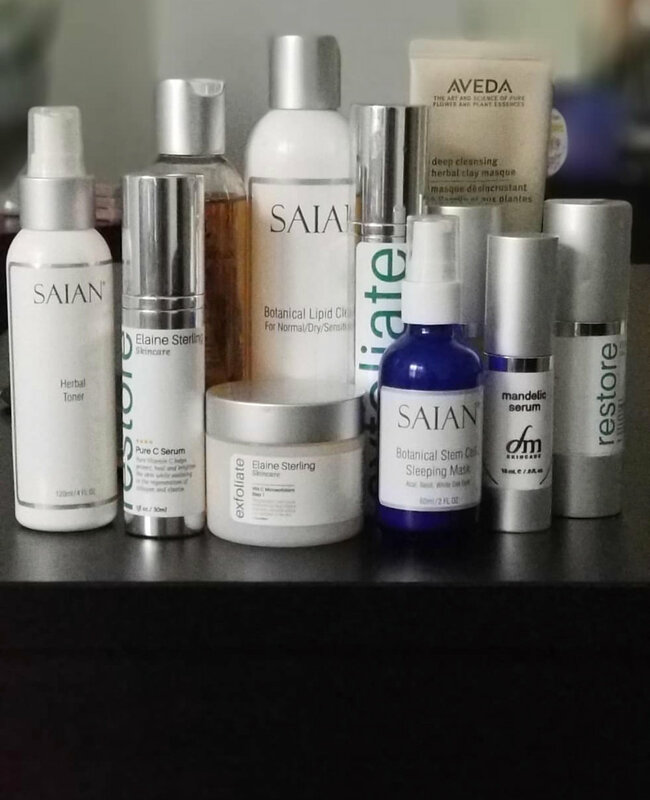 Saian has some power house products to rebuild skin. We also love her line because it includes some wonderful natural soothing products. We put Chris on Saian’s Botanical Lipid Cleanser and Herbal Toner. These two will feed his skin and nurture with vitamins, herbs and minerals. In order to start the rebuilding process and reinforce all of that fresh, new, even-toned skin we gave him Saian’s Active Renewal Serum, and Botanical Stem Cell Sleeping Mask. These products are rich in peptides and stem cells to make sure that his skin cells function properly to make sure he looks amazing!